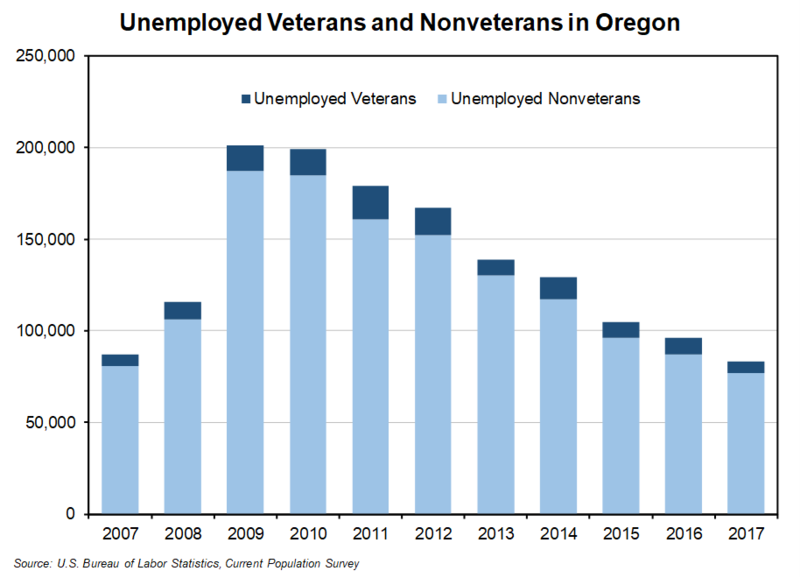 In 2017, the unemployment rate for veterans in Oregon was 4.3 percent, according to the Current Population Survey. This was the lowest unemployment rate for veterans since 2007, when the unemployment rate was 3.5 percent. Overall, Oregon’s unemployment rate was 4.1 percent in 2017. Across the U.S., veterans had a lower unemployment rate of 3.7 percent. About 305,000 veterans lived in Oregon in 2017. Half of veterans (153,000) were not in the labor force. This figure could be related to the age of veterans. According to the American Community Survey, more than half of Oregon’s veterans were age 65 years or older and served in the military at least four decades ago: Vietnam War (110,668 veterans), Korean War (23,024), and World War II (9,491). Gulf-War I and II veterans accounted for 90,412. Around 145,000 of the 152,000 veterans in the labor force were employed, with 123,000 being employed full time and 22,000 part time. About 6,000 veterans were unemployed, which accounted for 7.2 percent of the unemployed population (83,000) in the state. Over the last two decades, unemployed veterans made up between 6.9 percent and 14.6 percent of the overall unemployed population in the state. Veterans are more likely to have a disability, but less likely to be in poverty than the general population. About 32.8 percent of Oregon’s veterans reported having a service-connected disability, compared with 15.1 percent of the total civilian population. About 8.1 percent of veterans were in poverty compared with about 12.8 percent of the total civilian population. Read the full article written by Economist Felicia Bechtoldt.